A similar group, with a different focus. 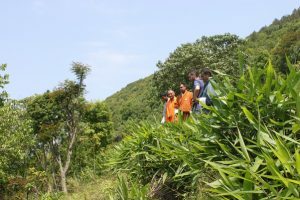 The NWFP group of Batasey, Tsirang is working together to “manage their community forest and NWPFs by focusing on broom grass production and marketing”. Broom grass is a multipurpose perennial grass that only assists in soil management but also used as a fodder for livestock and to make “brooms”. This group collectively identifies community land for nursery establishment, plantation of seedlings and creates awareness on the importance of the broom grass and diversifying source of income for the community members. The group has effectively managed to source technical experts from the Dzongkhag Forestry office and seek support from the local government offices for their activities. Additional interested women from the community were also registered as new members. They will eventually work on improved harvesting and packaging of the broom and initiate marketing of the product. An exchange visit in the neighboring country (India) will also be carried out to learn and share experiences.